Danielle Miraglia is a Boston treasure. Period. We are fortunate enough to have one of the best regional blues-centered music artists in our midst, a special performer whose full band shows (with her band, the Glory Junkies) are blues-rock and whose solo acoustic shows are more blues-folk, but they always carry that original Danielle Miraglia spark, that glint in her musical eye, and that fun, amusingly thoughtful emotional and intellectual sincerity. The entire east coast is lucky to get a chance to experience her music during her tours, but we in the Boston area can get a regular dose of her musical magic, and the fact that she typically draws strong crowds even with her frequent performances is a testament to how much we appreciate her considerable, world-class talent. 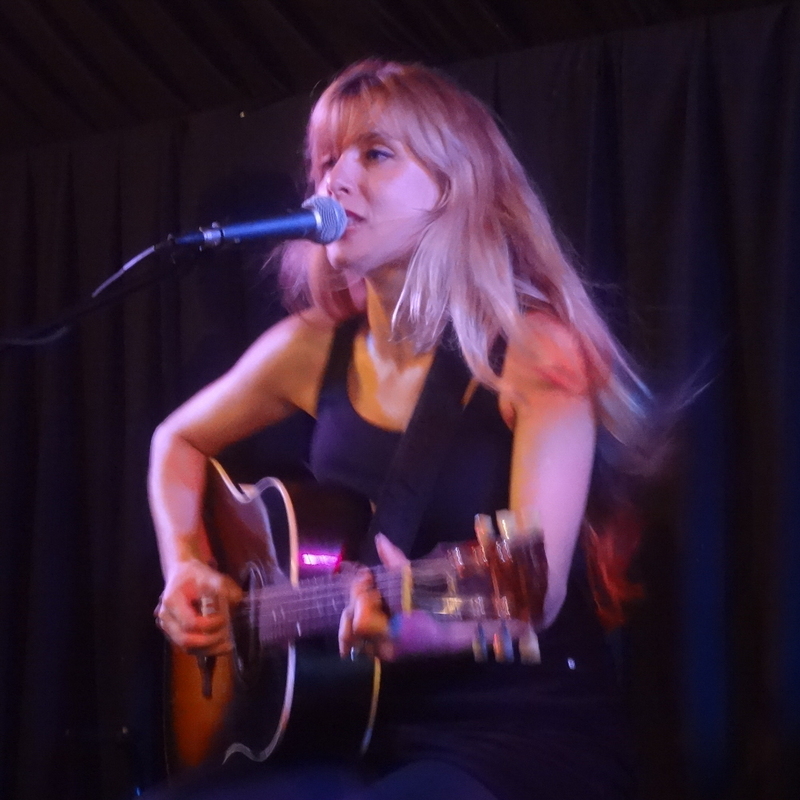 This is my fourth review of Danielle’s music since the Blog‘s launch, but it is the first in more than a year. I reviewed her last album, a 2016 set at Atwood’s Tavern, and last summer’s gig at Front Street Concerts. 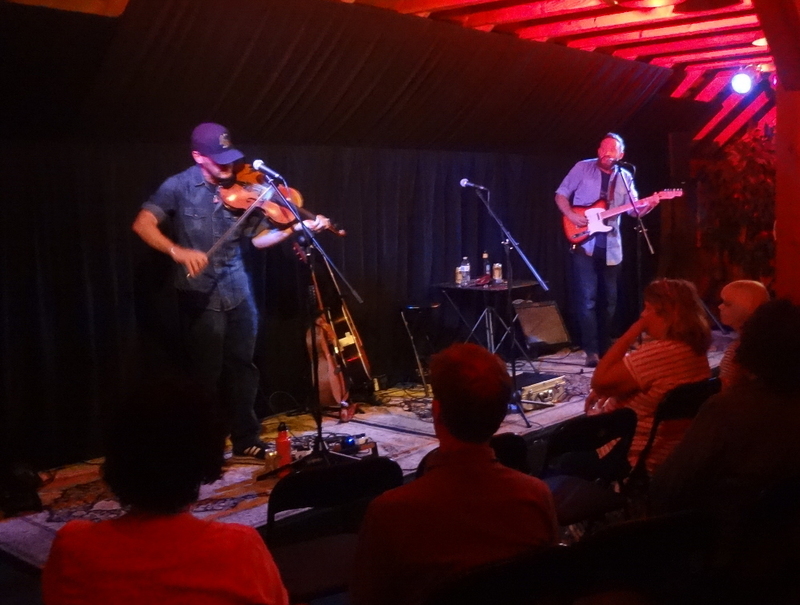 Front Street Concerts, meanwhile, is a favorite venue, perfect for a pleasant summer night. 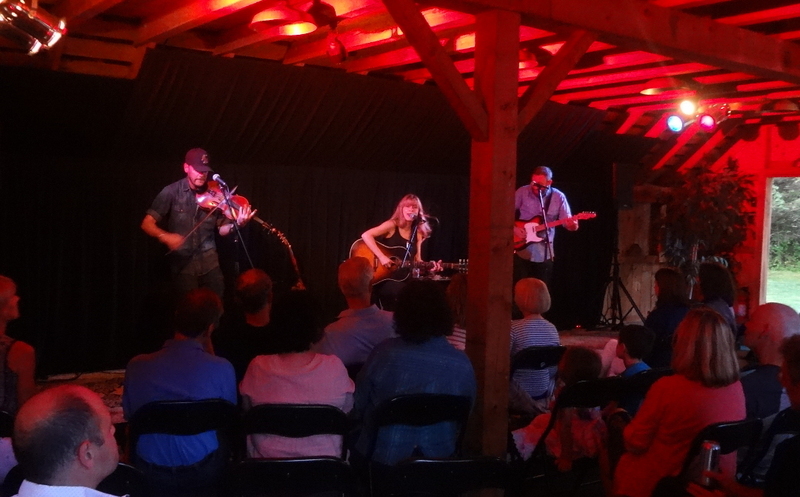 It’s a backyard “house concert” with a dinner buffet and a purpose-built barn featuring a stage and a sound system, with wide-open barn doors and a tent allowing most attendees to sit outside on lawn chairs. Even without the music, it would be a great place to spend a summer evening. But, of course, the concert series organizers always, dependably bring in exceptionally talented musicians. 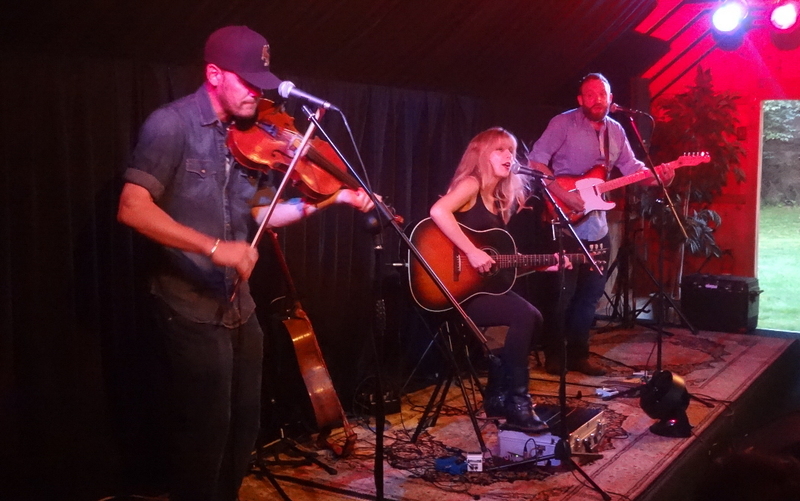 On this particular evening, Danielle performed fronting the Glory Junkies Trio, flanked by violist Laurence Scudder and guitarist Erik White from her Glory Junkies band. Using a stomp box where added percussion was necessary (as she does during solo acoustic performances), Danielle delivered a perfectly rockin’ evening of blues and blues-rock. 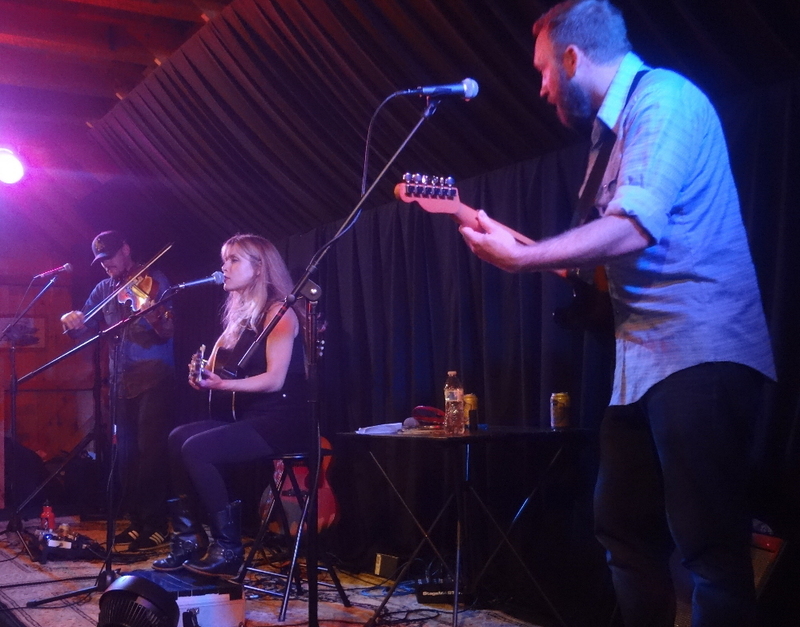 The Trio kicked things off with one of the songs that first turned me on to Danielle’s music, “See the Light” from her 2011 Box of Troubles release. This is almost hillbilly blues-rock, showcasing her bandmates’ skills, hinting at the offbeat humor occasionally hidden in Danielle’s lyrics, and featuring her strong, versatile voice, touching upon its raw power while built around the textured emotion that makes her mid-range so powerful. She followed that with a pair of songs from her Glory Junkies disc. “Fair Warning” sports a cool, almost syncopated sound in its trio arrangement, while “Famous For Nothing” is driven by kind of a chunky rhythm when performed live, a cool rendition of this album favorite on this particular evening. Next up was the first of Danielle’s new originals to be performed this evening, “All of My Heroes are Ghosts.” Classic, gritty, growly Danielle Miraglia at her best. It was during this song, in fact, that I was compelled to comment to the person standing next to me, “Oh, my God! That thing in her voice!” Vintage. Or, rather, new, since it’s one of the songs I assume will be on the album she’s currently recording. Late in the first set came another favorite new song, the topical, timely “Make Your Own News.” On the whole, the tune chunked along like a classic blues rocker, but the bridge almost seemed to borrow from seventies pop-radio harmonies, and there was a fun viola solo well worth its own shout-out, as well. After that, Danielle shook the joint with the raucous “Stagger Lee” before mellowing a bit on “Home,” a powerful song whose sound is always so warm and uplifting, a tune that displays the richness of Danielle’s voice that makes this sort of connection possible. And, of course, she closed the first set with a Janis Joplin cover, just one of many iconic artists whose songs fit her voice so well. The second set started with two songs sans Danielle, as Laurence and Erik have their own band, Spotted Tiger. So we were treated to a couple Spotted Tiger tunes. 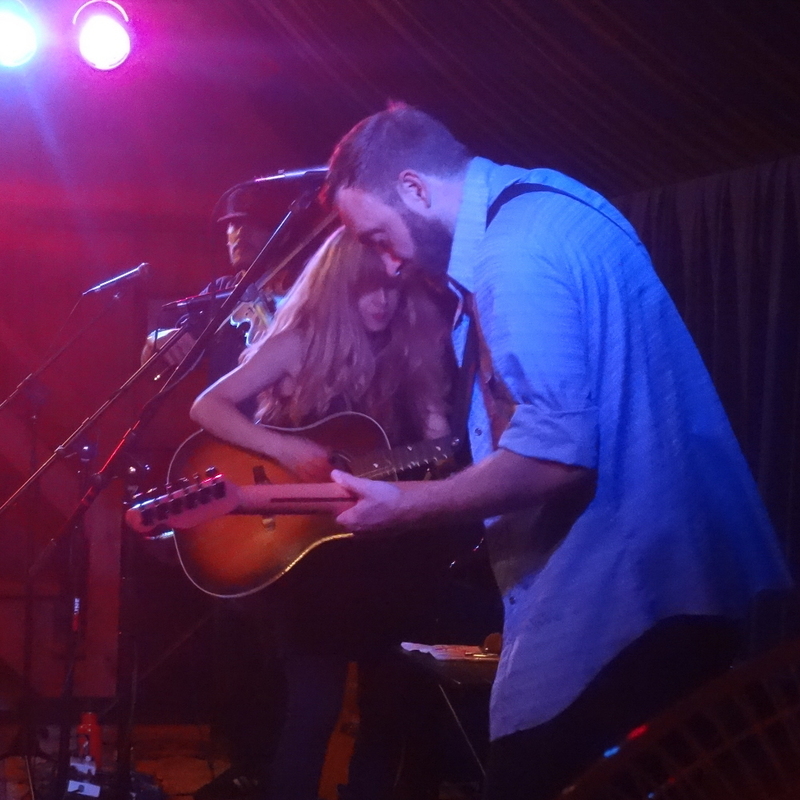 The first was an almost hillbilly-ish Americana number; the second more like energetic folk. Indeed, these guys form a cool duo. I saw them perform a full set as Spotted Tiger once before, the spring before I launched the Blog. Then Danielle was back to finish off the night. The second set featured a couple favorites from the Glory Junkies disc, “Dead End Street,” in which I love the funky pop element that interacts well with Danielle’s blues snarl, and “Coffee Stained Thank You Cards,” a song that would easily win my vote as the best blues-rock song to mention sarcastic zombies in the lyrics. Notable, as well, was new original “Everybody’s Wrong.” This one shows off Danielle’s blues howl – my notes from the evening simply say “Grrr!” and “Wow!” – in addition to some almost Chuck Berry-esque axework by Erik White. The final set also included several covers. There was a Dylan cover, the heartfelt, melancholy “I Want You.” And a Prince cover, of course: “Gett Off.” And notably, as usual, a show-closing, wailing rendition of Tom Waits’ “2:19,” a Danielle Miraglia concert staple that she always makes her own. There’s rarely a better way to spend a Saturday night than at a Front Street concert. 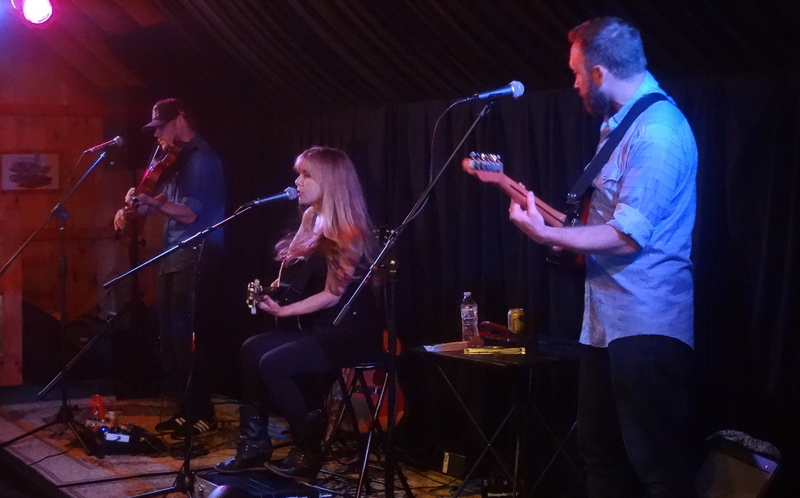 And there’s never a better evening than a Danielle Miraglia concert. Combine the two, and you get a true summer memory. There’s just one Front Street Concerts event left this summer. That’s next Saturday, August 19th, featuring Tim Gearan. If you can get out to Hopkinton next Saturday, it’s well worth it. But you need to RSVP in advance to reserve your spot. Danielle Miraglia, of course, has several shows on her schedule. Next up is August 26th at Lemifest in Mashpee. Then, on August 27th, as part of the Charles River Reprobates in Newburyport. You can also catch her on September 3rd at the Plymouth Folk and Blues Festival in Plymouth, VT and on September 9th at the 7th Annual Haverford Music Festival in Havertown, PA. Be sure to check the “Shows” page of her website for details and check back regularly to stay current. Indeed, this is one of the thinnest schedules I’ve seen on her website in a while, so I’m sure there will be more shows added soon. Spotted Tiger also has a few gigs coming up, as noted on their website. They’ll be onstage tonight, August 13th, at Toad in Cambridge, MA. They’ll be at Bull McCabe’s Pub in Somerville, MA on September 22nd. And they have gigs listed in Beverly and Salem, MA and Nashua, NH on various dates from October through February. For more details, see their website. This entry was posted in Live Reviews and tagged Danielle Miraglia, Geoff Wilbur, Geoff's Night Out, Live Review. Bookmark the permalink.